Recently, our friend and co-author Sid Suri predicted that a soccer match would end 2-1. This got us thinking. Suppose you didn’t say which team would score 2 and which would score 1. And suppose people considered you “close” if you got within one goal of 2-1 (so 1-0, 1-1, 2-1, 3-1 or 2-2 would be close). How often would you be close by guessing 2-1? We’ll save the answer for the end of this post. To figure this out, we went to http://www.football-data.co.uk and pulled every English soccer match from 1993 to 2016 (so far), for the following leagues: Premier, Championship, League 1, League 2, Conference, Division 1, Division 2, and Division 3. In all: 52,017 matches. First, let’s establish that soccer is a low-scoring sport. 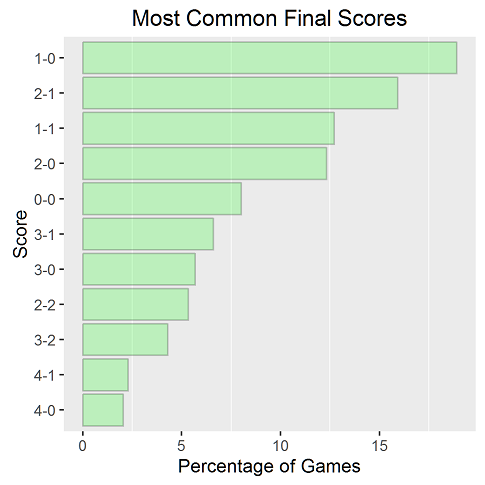 We see below that a two-goal match is the most likely outcome in soccer. 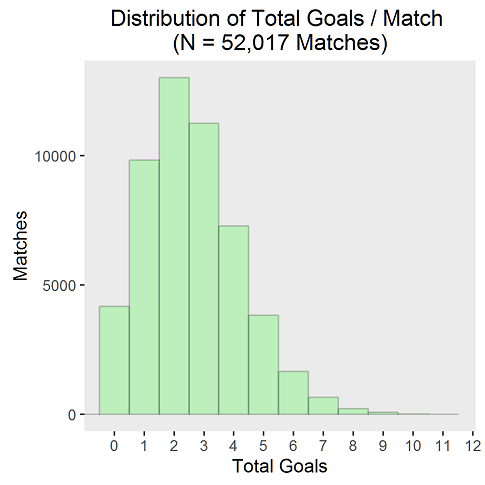 The average number of goals per match is 2.6 (median 2). This leads to certain low scores (where a score is a high-low pair) being quite common. The graph at top of this post shows that 1-0 (or 0-1, which is the same thing by our definition) is the most common outcome of a football match there is. Nearly 20% of matches end 1-0. Now to our key question. What score is just one goal away from the most soccer matches’ scores? It’s close, but the winner is 2-1. 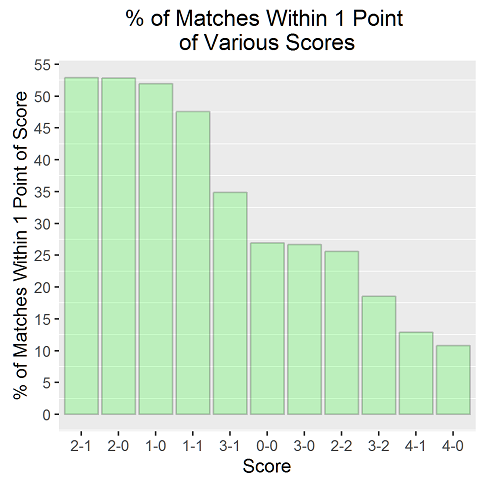 52.9% of matches end within one point of that score. So if you can be vague about who you predict will win, just confidently proclaim that it will end 2-1 and you’ll be right most of the time. Same deal for saying 2-0 or 1-0. All three of these scores are within one point of most soccer matches’ outcomes. One cute math-y thing about this is that some scores are one point away from more possible scores than others. See below. 2-1 is within one point of five scores (including itself), but 2-0 is only within one point of four possible scores. Same with 1-0. 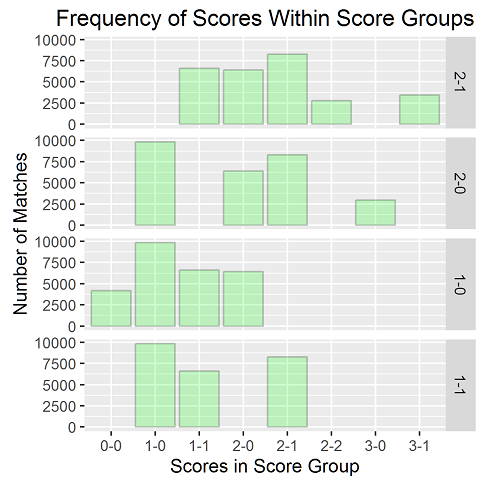 To consider why, realize that scores can’t be negative. Despite being neighbors with fewer scores, 2-0 and 1-0 are within one goal of roughly the same number of matches as 2-1 is. Even 1-1 does quite well with just two neighbors beyond itself. The figure above shows the counts of each of the neighbors of (from top to bottom) 2-1, 2-0, 1-0, and 1-1. This is why I don’t watch soccer. If the score is 2 to 0 in the second half the game is over. Never mind the second half. It’s generally over in the first half when they score that many goals. Most soccer matches are within one goal of 1-0 was written on March 1, 2016 and filed in Ideas,R.